We ALL love pasta, right?! It's one of those foods that is such a comfort food. And because it is such a comfort food, it is VERY easy to over eat it! Seriously…it is easy to eat an enormous bowl and still go back for more. Sound familiar? But for people with diabetes or prediabetes, it's not really possible to eat an enormous bowl of pasta because you will soon see your blood sugar skyrocketing. Not to mention, all those extra pounds stacking on if you over consume the carbs! 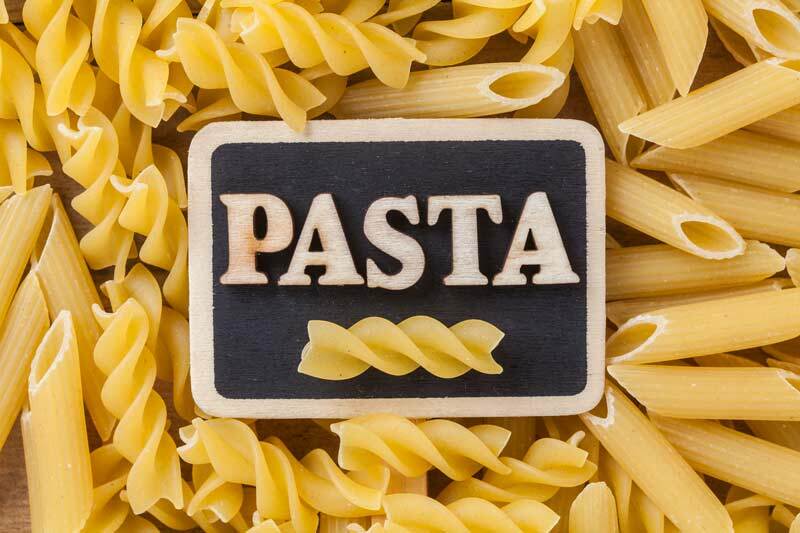 So let's go over some pasta nutrition facts and talk about the best pasta for diabetes – including options and alternatives. Let's compare the nutrition facts for 1 serving of pasta. One serving is equivalent to half a cup. As you can see from these comparisons there is between 18-22 g total carbs and between 15-20 net carbs. While whole wheat pasta (the brown kind) is somewhat better than it’s white counterpart, overall there’s not too much difference between the carbohydrate content in most forms of regular pasta. Also, we’re often told whole grain pasta and other whole grains are high-fiber foods, but they’re actually not that high. Two carrots provide more dietary fiber than 1/2 cup whole wheat pasta! 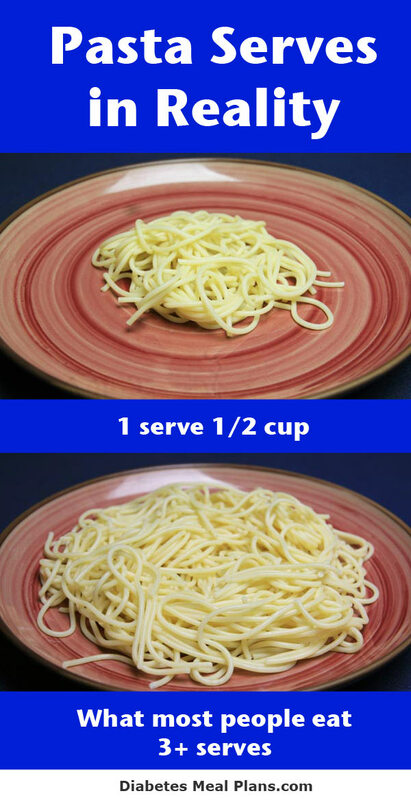 The images below show the reality of pasta servings. The first one is only half a cup and as you can see it doesn't really amount to much when put on a normal sized dinner plate. Then we have what might be someones typical serving of pasta (if not more). In the second image we see about 3 times as much, so 3 serves of white spaghetti like this amounts to 64.8 g total carbohydrates. Visual comparisons are great because it really lets you see the difference. 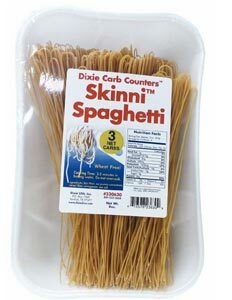 While you could try to justify that eating whole wheat spaghetti would be okay with 2 serves being around 30 g net carbs, over the long term this is just too many carbs and you will most likely find you can't control your blood sugar properly. Carbohydrates are the nutrient that has the greatest impact on blood glucose and A1c levels. Even keeping portion size small with pasta (1/2 cup), still contributes around 20 grams of carbs, before you add anything else. There’s not a lot of fiber to slow down that large influx of dense carbs, and unfortunately, that brings blood sugar levels up, plain and simple – pasta is a high carb food. 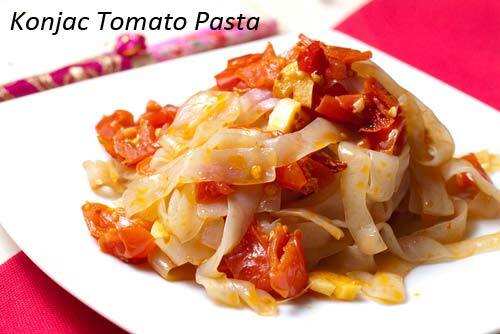 Pasta contains very little nutritional value in terms of vitamins and minerals. Whereas eating lots of non-starchy vegetables – zucchini, broccoli, cauliflower, eggplant etc – provides your body with an abundance of nutrition, along with many other valuable beneficial health properties. In terms of glycemic index, surprisingly pasta is a low glycemic index of around 50. Anything below 55 is considered low. But the glycemic index doesn’t subtract all those carbs, which will still end up in your bloodstream. 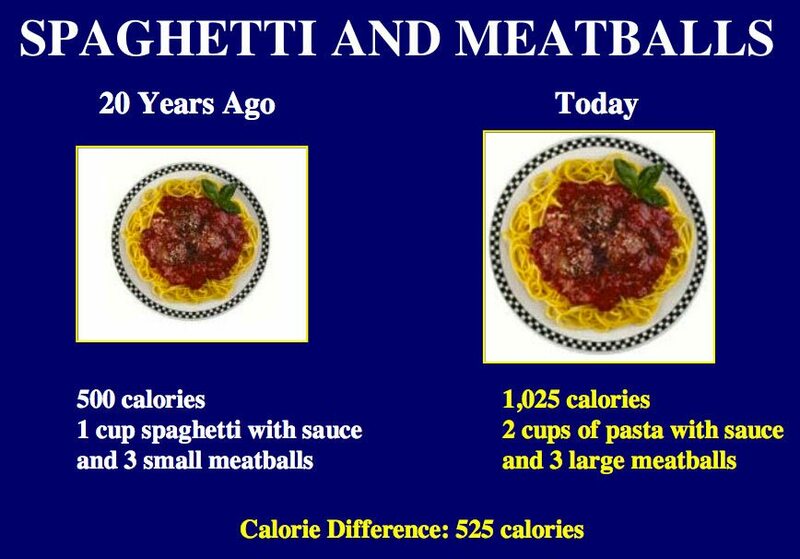 And, with the portion sizes we're commonly eating today, UP goes the calories (and subsequently, your weight) too! What's The Best Pasta For Diabetes? Sure, the traditional pasta might not be the best pasta for diabetes, but you've still got plenty of options. Have you heard of konjac noodles before? They are zero carb Japanese style noodles and come in fettuccine, penne, and even lasagna – check out the full details on konjac over here. Konjac noodles make a great replacement for all your pasta needs and you can purchase it directly from a supplier like Miracle Noodles or even from Amazon. They do have a different texture to pasta and are a little chewy. But you can eat them with a bolognese, a carbonara, an Italian sauce, a cheesy white sauce (pictured below), or anything you choose. And at least you know they aren't going to send your blood sugar soaring. 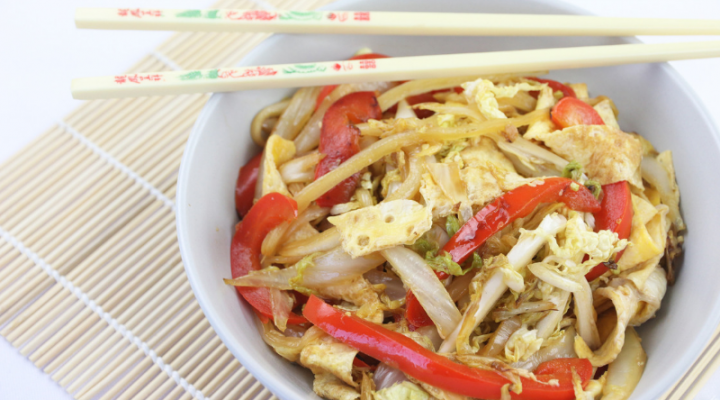 You can eat a BIG bowl of konjac noodles without any worry because they contain zero net carbs! 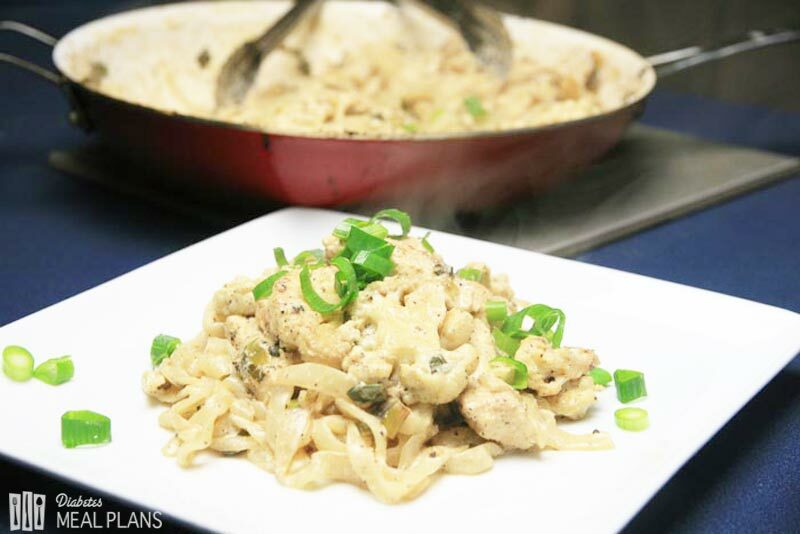 That dish above is a Creamy Mustard Chicken Noodles and uses konjac noodles. Another bonus with konjac noodles is you don't really have to cook them, you just rinse them off and add them to your sauce. They are best when rinsed very well, then soaked in hot water, before rinsing again. This removes the strange smell that konjac has. Check out the nutrition chart with konjac noodles in the picture – zero net carbs! What About Other Pasta Options? 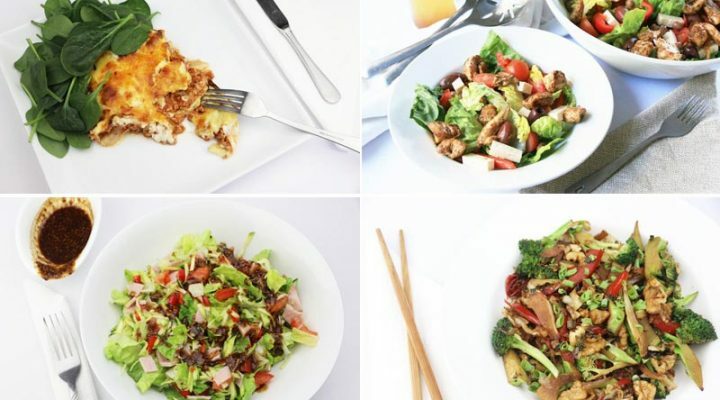 There are still even more options because many companies make lower carb pasta options. Here's some you can explore. Netrition has a lot of great low carb diabetic friendly foods and one of those is the Ciao Carb pasta range. The regular range has 12 g carbs for a 50 g serve, which isn't too bad if your sauce doesn't contain too many carbs – and there's no need for it to! Ingredients: Isolated soy protein, egg white, wheat gluten, wheat flour, wheat fiber, stabilizer, guar gum E412, psyllium. This penne pasta costs $3.49 for a 8.8 oz/ 250 g pack. 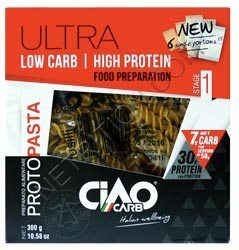 Ciao Carb also have a Proto Pasta range, which comes in at just 7 g carbs per 50 g serve. That's about a half cup serve, so if you doubled your intake you'd still be keeping your intake to around 14 g net carbs. It's $4.99 for a 10.5 oz/ 300 g pack. It comes in a fusilli, pasta rice, a penne, and a tagliatelle. All versions of the Proto Pasta range are 7 g per serve, so it is a much better option to their standard low carb range. Ingredients: Isolated soy protein, pea protein, wheat flour, wheat gluten, wheat fiber, egg white (5%), stabilizer: guar gum. 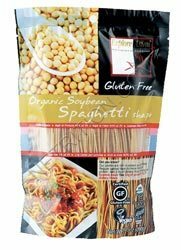 The organic soybean spaghetti contains 7 g net carbs per serve, at $3.49 for a 7.05 oz. (200g)pack. Ingredients: Organic Golden Soybean, Water. The black bean spaghetti is a black spaghetti! 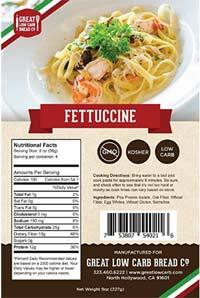 It's the same price as the soybean spaghetti and comes in with a little less carbs at 5 g net carbs per serve. Ingredients: Organic Black Beans 92%, Water 8%. 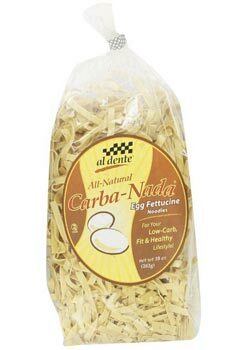 This Carba-Nada pasta is low carb compared to traditional pasta. 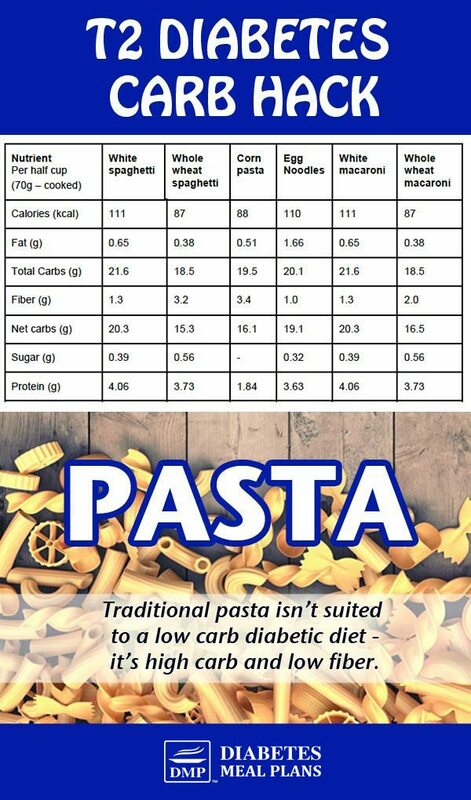 Traditional pasta has around 20 g carbs per 1/2 cup pasta, whereas this Carb-Nada pasta has 18 g carbs per 1.5 cups pasta. So if we cut the serve in 3, we're left with 6 g compared to 20 g for the same size serve, which isn't too bad. Egg pasta still uses some flour but they use eggs to make up the difference, and since eggs are a protein, that significantly lowers the carb count. Ingredients: Enriched Semolina Flour, wheat gluten, malto-dextrin (fiber), digestive resistant cornstarch, soy flour, water, whole eggs. A 10 oz. bag will cost $7.07 but you can get it cheaper by buying a pack of 6 for $19.97 bringing it down to $3.32 bag. 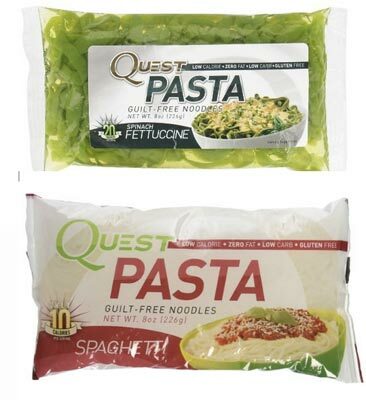 If you were to do a search for low carb pasta options, you might come across Quest pasta. Quest is a popular low carb brand that does have a lot of diabetic friendly products. Their Quest pasta is basically just konjac noodles. For an 8 oz / 226 g pack you're looking at $8.95 per pack, which is for 2 servings. But if you buy it in bulk, you can slash the price to $3.49 per pack. A 12 pack of spinach flavor costing $41.99. Quest pasta has zero carbs. Ingredients: Water, glucomannan fiber, calcium hydroxide. 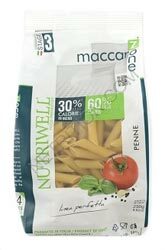 These pasta noodles are made from various fibers, and because of the high amount of fiber the carb count per serve is only 8 g.
Ingredients: Oat fiber, wheat fiber, wheat protein isolate, egg whites, durum flour. For a 6 pack of ThinSlim pasta costs $49.99 on Amazon, which is $8.33 per pack, so they are on the higher price side. But if you buy them from Netrition you'll get them for $7.99 per pack. Kelp is seaweed, so to make the noodles they remove the outer layer of the seaweed to reveal the inner ‘noodle' like structure. Kelp noodles are very nutritious, full of vitamins and minerals. Sea Tangle kelp noodles are the brand you'll most likely find. They are okay but their texture isn't soft like pasta, it's more a crunchy style noodle. This means they work well in salads, or where you don't mind having a bit of a crunch. Like konjac noodles, they have zero carbs. They also have no flavor so they can be included in almost anything. 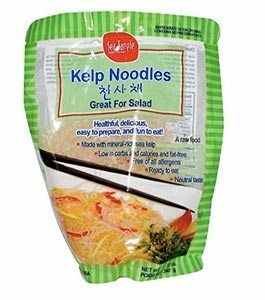 A 12 oz pack of kelp noodles will cost around $6-7 per pack on Amazon, or from Netrition you'll pay just $3.09. This spaghetti does seem great with only 3 g net carbs. It's made with soy flour, soy protein, and fiber. But again the price seems a little on the high side at $8.49 for an 8 oz. serve. And it doesn't seem to be all that popular, only having 2 reviews on Amazon, one good, one bad. So if you're really looking to manage your blood sugar properly you still have lots of pasta options that are far better than the traditional pasta. 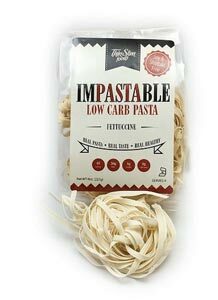 The Low Carb Bead Co, who make all kinds of low carb breads, buns and bagels, now make a pasta too. Their 227 g pack contains 7 g net carbs per serve, at around $14 pack (4 serves). Ingredients: Pea Protein Isolate, Oat Fiber, Wheat Fiber, Egg Whites, Wheat Gluten, Semolina. There’s something about a fresh basil pasta sauce or that tomato sauce topped with Parmesan cheese, or even a deliciously creamy Alfredo as one of your main dishes – Mmmm, even the thought gets your mouth watering, right? We understand, a good pasta dish happens to be one of the favorite foods in most people’s meal plans. And although having alternatives will never be exactly the same, it is something you can get used to. For instance, make some delicious Italian meatballs and serve over Zoodles – zucchini spaghetti. 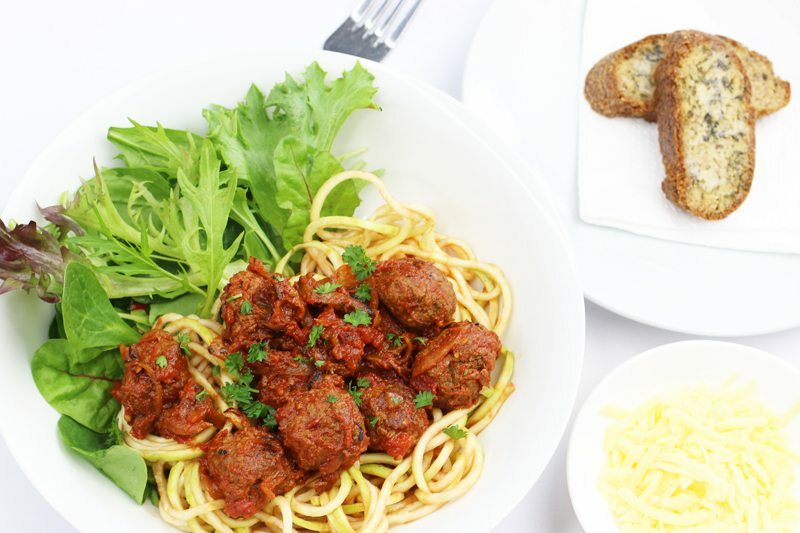 Our Spaghetti & Meatballs has just 10 grams total carbs. Our Garlic Bread is low carb, too! 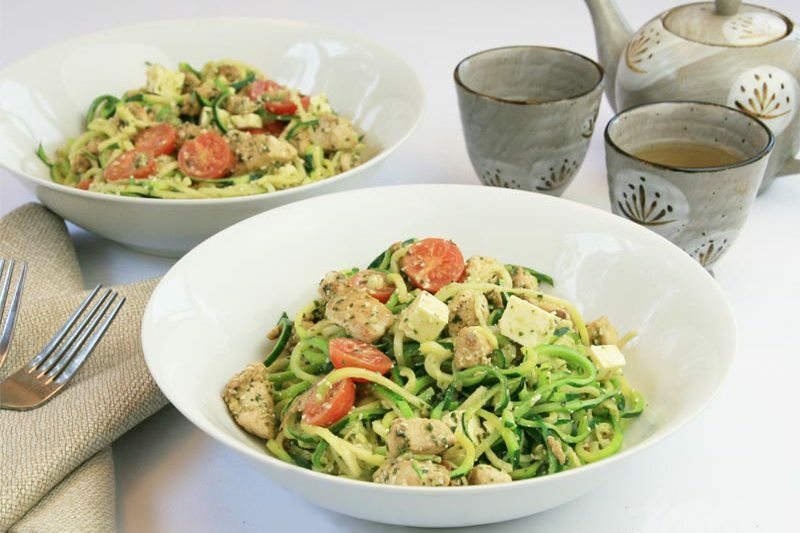 Cook up your chicken breasts and serve a fresh basil pesto over some Zoodles – zucchini noodles. Get yourself a veggie noodle maker – they will become a most-used kitchen item! There are many different veggies that make great noodle substitutes. And you’ll be pleasantly surprised how well veggie alternatives work. You can also serve sauces over salad or steamed veggies. The point is, replacing carb heavy pasta with veggies is going to help you lower blood sugar and A1c! Some people may find small amounts of pasta can be included in their meal plan, but most often, pasta is not a food that’s great for diabetes management – it’s a food that’s best avoided. The highest carb foods – pasta, rice, potatoes and bread – are those ‘staple’ foods that are easy to consume too much of. They have become staples because they are cheap fillers, but they aren’t really necessary in our diet. In terms of blood sugar and A1c control, you will definitely be better off excluding pasta from your diet. Use low carb alternatives and you'll soon see lower numbers all round! I want to be cured of diabetes and I believe you can help me do that. While there is no true cure for diabetes, we can certainly help guide you to make some dietary changes that may result in diabetes that is much easier to control. For started, have you tried a low carb diet? Check out some of the science behind this diet, and an approved food list over here. Thank you. I will be trying these soon.. I really appreciate all of the noodle options. We use a lot of pasta and rice in our house. But my husband is a meat and potatoes kind of guy. He does not like veggies or fruit at all. I know I’m going to have to disguise (blend) them in sauces. Any ideas, dishes, recipes would be super helpful. Which veggies should I focus on incorporating? Here is some info on best veggies to eat Leah. You’ll be surprised how people can adapt so keep at it! Hi, my husband and I recently found out we have type 2.. He love seafood and so we’ve been able to curb his numbers down just by adding seafood in for the week as well as PORTIONS of snack food high in protein. With no meds so far- thank goodness.. Me on the other hand not only do i have type2, i also have the following borderline high b.p., cholesterol , and my liver .. So i need to cut sugar, carbs and salt.. Question is how? Ive already cut sugar for the most part ALMOST completely out of my daily intake( most of that was in coffee)I’ve bought mrs.dash items for cooking,i also use olive oil for cooking, real unsalted butter. i dislike seafood so that isnt an option for me, PASTA is a big part of our lives i need help. Ugh..
How about giving some of the pasta mentioned in this article a try? The best way to ensure that you can STICK to a low carb diet is to find new creative ways to enjoy your favorite meals. 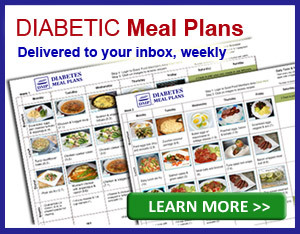 Here are some additional tips for getting started with a diabetic diet. Years ago we used to make our own pasta–just eggs and flour. My wife has now been diagnosed with diabetes. We have tried Basta made with chickpeas but am also considering whether home made pasta might also have a lower glycemic index. Perhaps half white flour and half chickpea flour (besan in Indian grocery stores) made with fresh eggs. Any thoughts? I’ve made our bread for at least 30 years and in the past year make only sourdough. I’ve seen studies showing real sourdough to have a lower GI than even whole wheat. 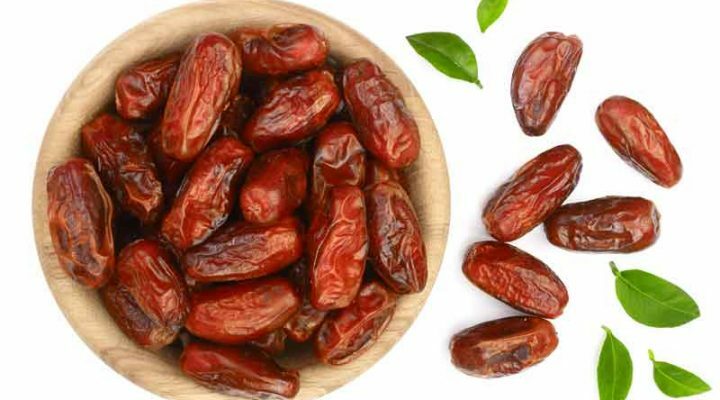 The easiest solution is to just skip the bread and pasta all together, however if that is not an option for your family, consider trying some of the suggestions listed in this article which are much lower in carbohydrates. ???? With talking to several diabetes nutritionists and sound lots of research, I am finding many of your responses here are coming into question. My husband and I eat by the glycemic index. We eat 100% buckwheat soba noodles and we both find that our blood sugar does not spike at all. You should be pointing people in the direction of nutritious real food. 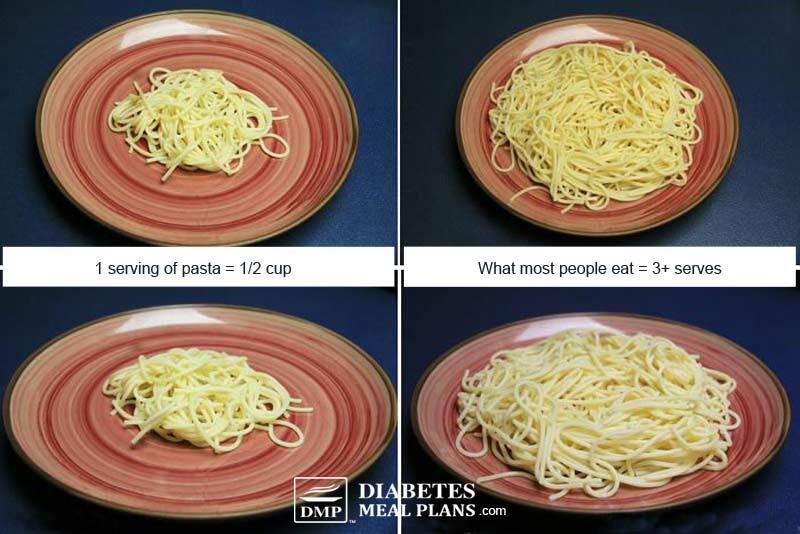 Portion control is a huge factor, even diabetics need healthy carbs, while natural foods. We have brought my husbands sugar down 250 points in just a month and a half eating this way. My blood sugar has been brought down from almost a constant 200 fasting to a constant 90-92 fasting with zero meds. Why don’t you encourage people to sautés up their choice of veggies put a portion of those on the plate add some soba noodles on top (drastically reduces your portion size and adds more fiber) then add your sauce and some protein, people need to start doing some research on their own. Look at ancient grains that have not been modified by man, look into Einkhorn wheat flour. Look at the whole picture you may be looking at carbs but the foods may contain resistant starches which are helpful to a diabetic. You make some valid points, Vicki. I agree that the MOST important diet factor is choosing whole, unprocessed foods. I also agree vegetables need to be the base of every meal– most people do not eat nearly enough vegetables!!! When it comes to moderation, many people struggle with this. There are some diabetics who may be able to eat a small portion of quinoa or some of those other ancient (whole) grains, but the problem we see is that most people can’t just eat 1 small portion which then results in a high carb blood sugar nightmare. Our aim is to help people improve their health, and lives, and many of our members have had great success following our meal plans, but if you find something works better for you and your husband then I absolutely encourage you to do whatever it takes to help you live your healthiest life!